This week we are shining our ThermoFun Member Spotlight on Tania Lee! Place all ingredients in TM bowl and combine 20 sec / speed 3. Add a little more flour and mix again if still overly wet and sticky. Roll out between two pieces of baking paper to approx. 5mm thick and cut out with a cookie cutter or just squares with a knife. Position on a lined cookie tray. Bake in oven 20 mins. Turn oven off. Turn cookies over and place them back in switched off oven for an hour to dry them out some more. If you (your fur babies!) enjoyed this recipe then please consider leaving a comment. It’s always refreshing to see comments from people that have tried a recipe and found it a success or tweaked it to suit. If you have a favourite recipe to share than please contact us and you could be featured in one of our Member Spotlights! We love to share!!! My daughter makes these for her furbaby and he loves them, my furbaby is a cross king Charles cavalier and she is very fussy,but i gave her one that my daughter had made and she loved it. So of to the kitchen to make her a batch.thankyou for the amazing recipe? Easy to make and very tasty, the humans in this house are enjoying them too! I have spelt flour but it isn’t wholemeal will this be ok to use ? Liz I have used them at least a month after making them. Just made a batch of these for our new rescue dog “Molly” and she loves them! Gobbled down two today so now we’ve got her daily breakfast sorted. Thanks! My dog loves them!! he’s very impressed. I did sub plain flour as I didn’t have any wholemeal, probably not as healthy but next time I’ll grab some wholemeal first. Thanks! That’s so awesome to hear Robyn! Doggy treats for a precious pup! My dogs love these biscuits ?? actually one of my humans does too ? Awesome to hear Kylie! Thank you! Hi I used the ingredients above but mine is very dry not wet enough to combine at all. Can you please help understand why this would be or what I could add to at least be able to roll out. Hi Christine, I’m wondering did you use a medium sized banana rather than a small one? Have to make this every week ..or double the batch…my guys stand on guard waiting for them to come out of the oven…I have to put one in the freezer to cool down or mummy gets into trouble….btw I don’t keep in the fridge and they keep fine …make sure they dry out properly!!! Super easy to make and are loved by the guide dog at work. Having said that, it’s hard to keep our two-legged friends away from them too! Made these 3 times already and will make again and again. Thank you for this fab recipe! My two dogs Nigella and Cocoa have been enjoying these cookies for years now! 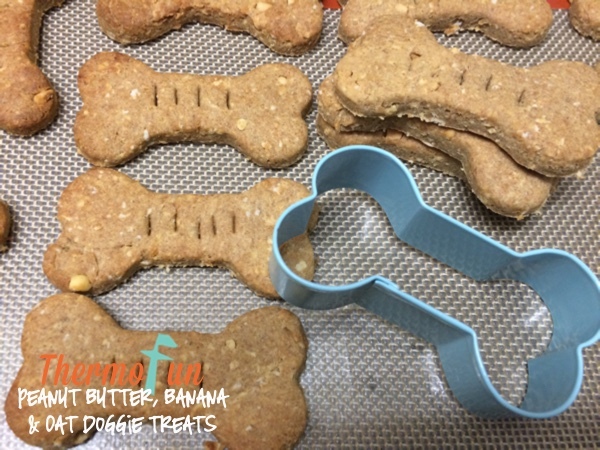 Have you thought about making any other dog biscuit/treat recipes? I would like to see one that uses mashed pumpkin or carrot. Heidi, I’m pleased to hear Nigella and Cocoa enjoy the cookies. I don’t have any other treat recipes as such, but make sure you check out Doggy Meatloaf and Honey’s Chow.